As we approched the site of St Aengus's Hermitage, our eyes were scanning the horizon searching for the round tower. Suddenly it dawned on us - the tall white structure looming in the distance was the tower totally hidden behind scaffolding and white sheeting! 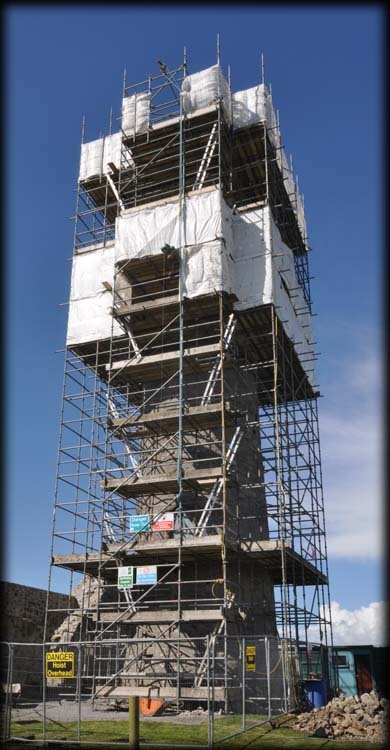 Based on the date that conservation had begun on the church (which is now completed but not accessible because of the locked fencing around the base of the tower and the scaffolding blocking the door) we believe that the tower conservation may take a few more years to complete. The tower is 67 feet high and probably dates to around the 12th century. 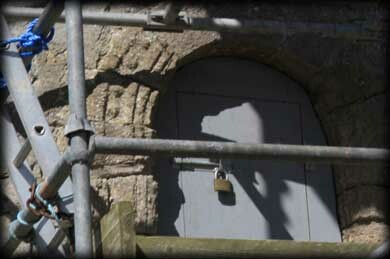 We could see a small part of a Romanesque doorway, pictured above. The church is thought to be of the late medieval period. 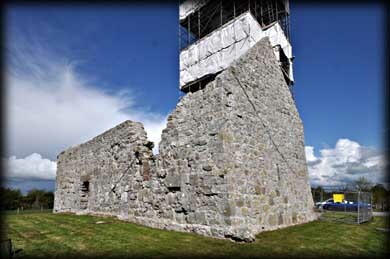 Aengus Culdee, a late 8th century Saint, joined the monastery at Clonenagh in Offaly. The Culdees - Servants of God - were a very strict religious community. Aengus came to Croom about 780AD and set up his hermitage here where he remained for only two years. He later entered the monastery at Tallaght. He died c.814 AD and was buried at Clonenagh. Situated: From Limerick take the N20 south to Croom. Then turn right toward Ballingarry. After 1k turn right then take the next right. Then keep right at the fork. The tower is at the end of this road. Discovery Map 65: R 4945 4131. Last visit April 2012. Door: Above ground 4.6m. Type: Arched. Windows: Three. 1 lintelled. 1 round and 1 angled.